Stainless Steel 310S Seamless Pipe, 310S SS Welded Pipes, ASTM A312 SS 310s Welded Pipes, Stainless Steel 310S Welded Pipes, Stainless Steel 310s ERW Pipes, 310 SS Seamless Tubes, ASTM A249 TP SS UNS S31000/08 Seamless & Welded Pipes & Tubes, SS 310S Welded Pipe, Manufacturer, Exporter, Suppliers, Mumbai, India. Stainless Steel 310S werkstoff nr. 1.4301 Pipes & Tubes Manufacturer, Exporter & Suppliers. Stainless Steel seamless & Welded Pipes & tubes Suppliers In India. 310S Stainless Steel Pipe combining excellent high temperature properties with good ductility and weld ability, is designed for high temperature service. It resists oxidation in continuous service at temperatures up to 11500C provided reducing sulphur gases are not present. It is also used for intermittent service at temperatures up to 10400C. Grade 310S (UNS S31008) is used when the application environment involves moist corrodents in a temperature range lower than that which is normally considered "high temperature" service. The lower carbon content of 310S does reduce its high temperature strength compared to 310. Like other austenitic grades these have excellent toughness, even down to cryogenic temperatures, although other grades are normally used in this environment. Grade 310L (and proprietary versions of this grade), is a 0.03% maximum carbon version of 310S, sometimes used for very specific corrosive environments, such as urea production. Stainless Steel DIN 1.4841/ 1.4845 Seamless Tubes Stockist, SS UNS S31000/ S31008 Seamless Tubing, SS 310S Cold Drawn Tubes, SS 310S Seamless Tubes, SS 310 Seamless Tubing In India. The stainless steel pipes can be manufactured in fixed lengths & random lengths between 4 & 12 meter. 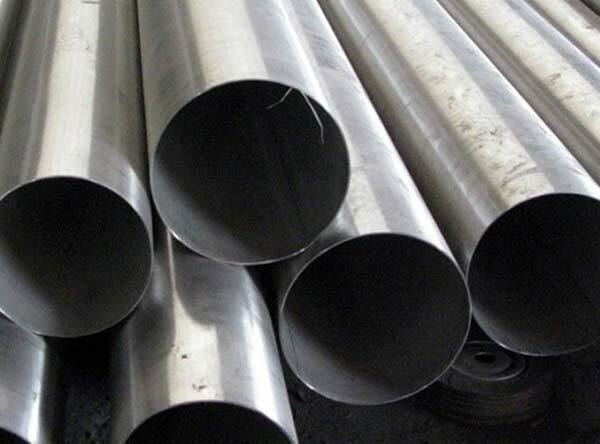 Stainless steel Pipes with an outside diameter between 6" (168, 3 mm) and 80" (2032 mm). Calico Metal stocks Stainless steel pipes and standard piping which is ordered in accordance with ASME/ASTM SA/A312 with dimensions and weights in accordance with ASME B36.19. ASME B 36.10 available on request. Lengths of pipe are standard 6 meters. We stock austenitic grades in 304L and 316L. Other grades such as Duplex, High Nickel Alloys, heat resistant stainless steels, 904L can be sourced internationally accordance with the customer requirements. Calico metal has its very own large bore pipe plant that can produce piping from 12 inches to 80 inches diameter in full 6 meter lengths to any International Specification or customer requirement. Heat exchanger tubing can be supplied to client’s request. Alloy 310 is an austenitic stainless steel that combines excellent high temperature properties with good ductility and weldability. It is typically used for elevated temperature applications as its high chromium and nickel content provide solid corrosion resistance, excellent resistance to oxidation, and superior strength in temperatures up to 2100°F. Due to its high chromium and nickel content, it is superior to 310 or 310S stainless in most environments.